At least 23 people have been hurt in clashes outside the Spanish Parliament in Madrid, as hundreds of protesters gathered on Saturday to demonstrate against newly proposed anti-protest legislation. The demonstrators held signs that said 'Freedom to protest’ and 'People's Party, shame of Spain!' while police and barricades prevented them from getting any closer to the parliament building. 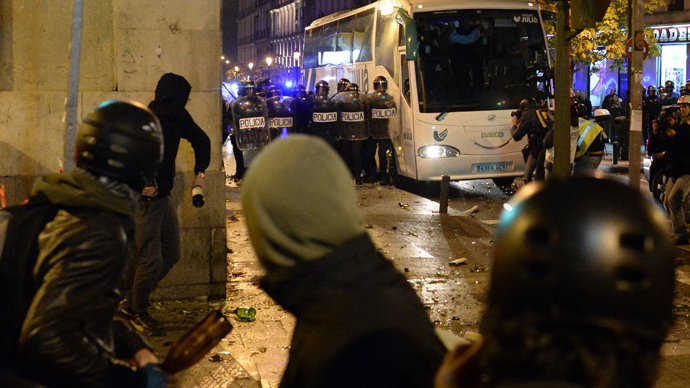 The rally in the heart of the Spanish capital finished by 10 p.m. local time, with at least seven protesters detained and 23 people injured - 14 of them police - EFE news agency reports. The new law, drafted by Spain's ruling People's Party, would introduce fines for activists taking part in unauthorized protests, publishing images of police, or interrupting public events. Demonstrating near parliament without permission could result in a fine as high as 600,000 euro (US$824,040), while insulting a police officer could cost a demonstrator up to 30,000 euro ($41,202).